As I mentioned in the Introductory Post, Milestone Memoir is my vision of marrying one picture (worth 1,000 words) with one personal essay (500-1,500 words) to create a meaningful narrative for future generations. This method varies from traditional scrapbooking in that it places more emphasis on the written word, and less attention on decorative elements. While journaling is always encouraged, many scrapbookers treat writing as an after-thought. We try to ensure that the 5Ws are addressed (who, what, where, when, and why), but we tend to focus more on the layout’s visual appeal. Please note that I do not see Milestone Memoir as a replacement for current scrapbook techniques. Instead, I see it as coming along-side your other photo preservation methods. It is more of a hybrid of scrapbooking and storytelling – YOUR story that needs to be shared with others. Over these past few weeks, I have unveiled the nine-step process: Step 1: Brainstorm a Theme; Steps 2 and 3: Brainstorm Chapters and Review Photos; Step 4: Select ONE photo per chapter; Step 5: Page Layouts and Color Schemes. Today will serve as a recap. At this point in the process, the scrapbooking decisions are made and all that’s left is drafting and finalizing the story. 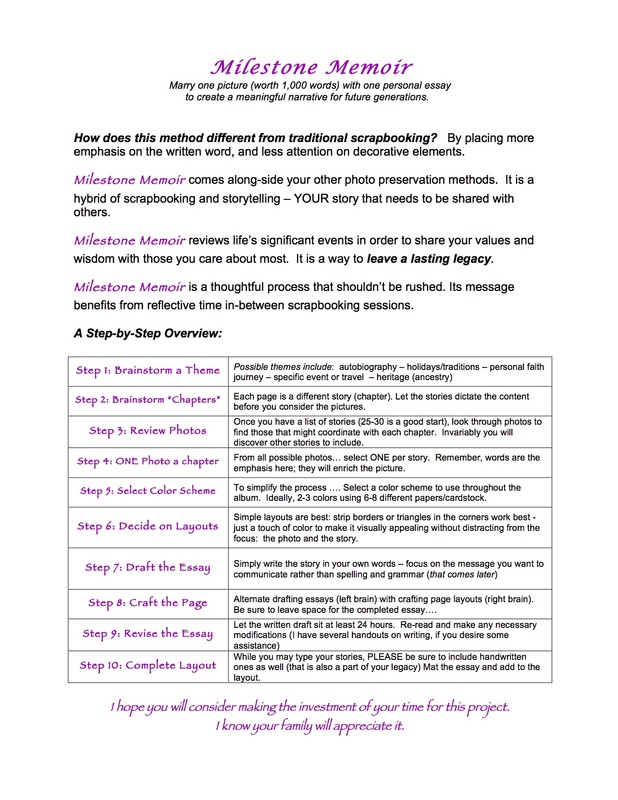 I will share a few tips for writing a personal essay next week, but for now I thought it might be helpful to share a handout that summarizes the steps of Milestone Memoir. I previewed this concept at my crop a couple of weeks ago, and I hope to hone the wording over the next few months. At that point, I will (hopefully) begin teaching classes. The crop was my first scrapbooking event since 2007, and it felt good to return “home”. I enjoyed the fellowship with old friends and gladly welcomed new scrapbookers into the fold. I plan to hold a crop-a-month in my home to encourage others to complete their projects and to inspire me to work on my own. Because I spent time in advance of the crop brainstorming a theme, outlining possible chapters, reviewing photos (and narrowing to just one per chapter), printing the pictures, and selecting a color scheme …. I managed to complete two chapters: one details my life as a December birthday, and the other reminisces my first home and neighborhood. I have about sixty-four more photos and corresponding stories to write, but I do not find this overwhelming. I have a notebook where I keep notes for each chapter, and I am continually reviewing the timeline to see if there is another story I want to include. I draft the essays on the computer, using the notes to help with structure. These two essays are approximately 350-550 words, and I wrote each in about thirty minutes. I want to reiterate, however, this is not a scrapbook to complete in haste. It benefits from reflection and thoughtful consideration of Milestone moments worthy of inclusion. It is a project that can be completed while working on other albums that perhaps use more right-brain creativity. I have set the goal of writing two essays per week with the hope of completing this first Memoir by the end of June. It is my plan to periodically post completed layouts and perhaps participate in Throwback Thursdays with nostalgic photographs. While this is not the writing life I envisioned a year ago…. it is the perfect writing life for me at this point in time. Interesting concept. Though a writer, I’m far more interested in preserving memories with pictures and allowing them to tell the image-rich story. The fewer words on a scrapbook page, the better. I’m very much into using images to illustrate not just events, but also concepts, rather than words. What a “Joy” it was to meet you at our Twitter chat the other night! 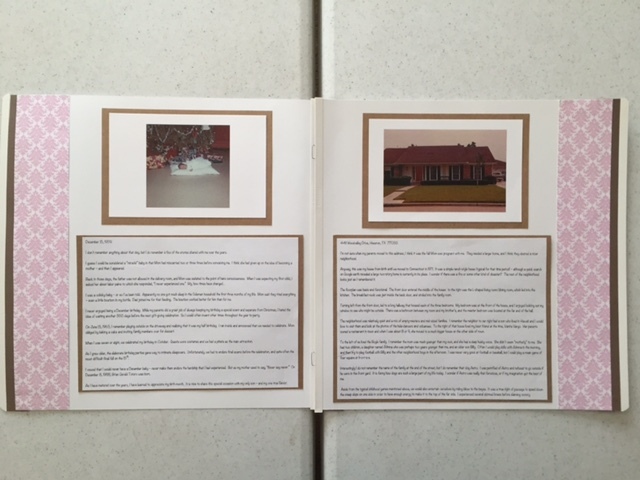 As a writer who is interested in the art of preserving one’s personal stories through both memoir writing and scrapbooking, I love what you are creating and sharing here! I look forward to reading more of your work and encourage you to share your creativity with us at Create With Joy!